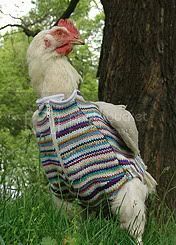 It used to be that when chickens got the flu, there was nothing to worry about. All they needed was a couple of days of bedrest, plenty of fluids and some of their own soup and a full recovery was guaranteed. 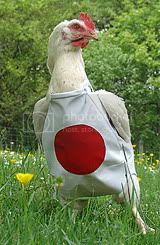 However we live in more complicated times now, where avian flu is a recurring problem in Asia. We might be well on the way to developing a vaccine but what about the chickens? Will someone please think of the poultry! Each time a new outbreak is reported, hundreds and thousands of our feathered friends end up being culled - that's a whole lot of potential kung pao chicken gone to waste. The answer lies with keeping the chickens healthy and disease-free in the first place. After all, prevention is better than cure. 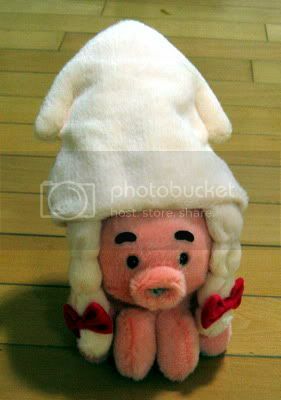 Thanks to an innovative Austro-Japanese collaboration involving chicken suits, we have found a way to do this. After spraying the suits with anti-viral disinfectant we can let our chickens don them like armour against the ravages of deadly virus. 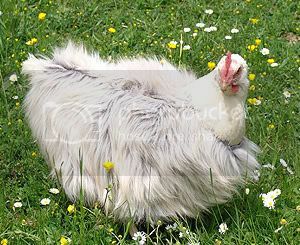 shy chicken? always want to hide? this is your model! your chicken is into skiing? well – this suit will keep it warm and comfy. It might take a while to make it onto the G8 agenda so in the meantime we're going to have to rely on your generosity. 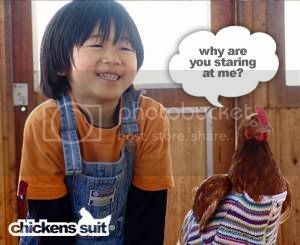 Please send a chickensuit our way today and make the coop a safer place for our children! those are so amazingly cute. odd, but adorable. 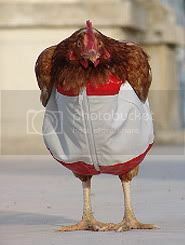 The world is not ready for chickens in combat gear. 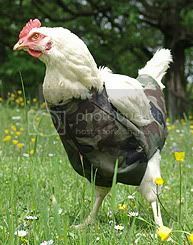 Or, more specifically, I'm not ready for chickens in combat gear. For some reason I'm hungry. OMG! Where do you find these links? Do you have too much time to surf the net, or do people email them to you? Cheers for another quirky start to my day. I dig your site!